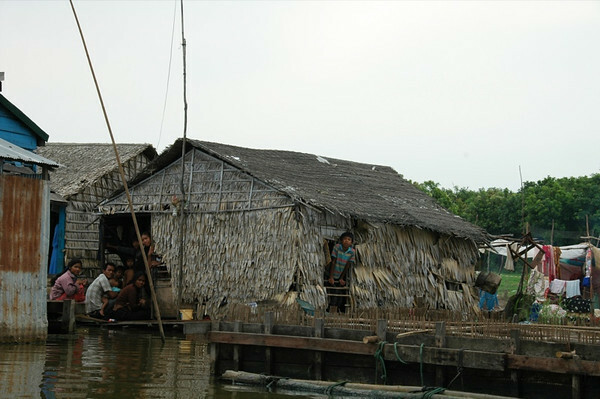 Multiple generations gather around the TV in a floating house on Tonle Sap Lake. Read more about this boat journey from Siem Reap to Battambang. 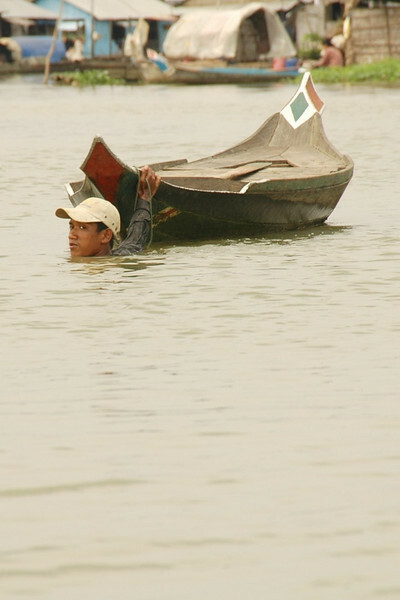 Read more about this boat journey from Siem Reap to Battambang. This woman has the fixings for soup and other breakfast items in her little boat. Read more about this boat journey from Siem Reap to Battambang. 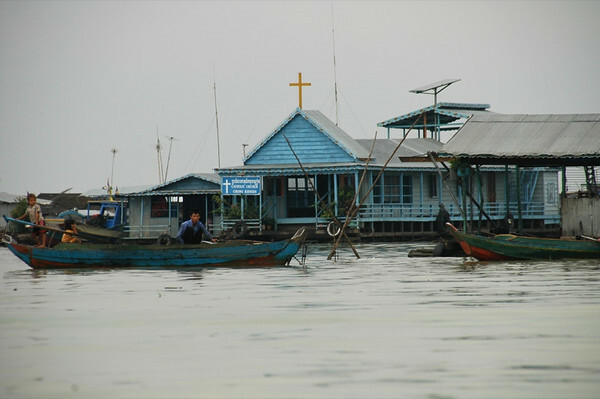 There are many floating villages and communities on the Tonle Sap lake near Siem Reap, complete with electricity, TV, schools and churches. A large number of ethnic Vietnamese also live here. Many came to Cambodia after 1979 when the Vietnamese helped overthrow the Khmer Rouge. 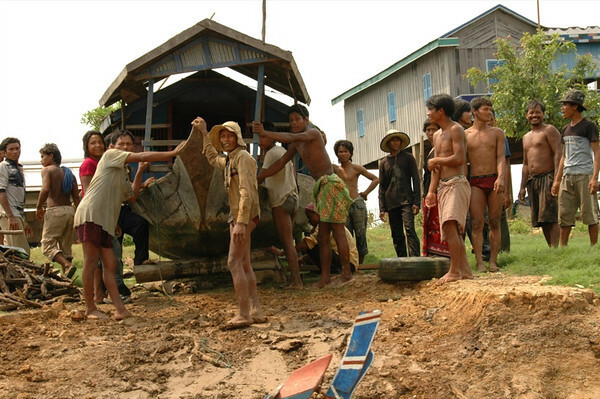 We were told that since they are not full Cambodians, they can't own land. As a result, they build their homes and businesses on water. 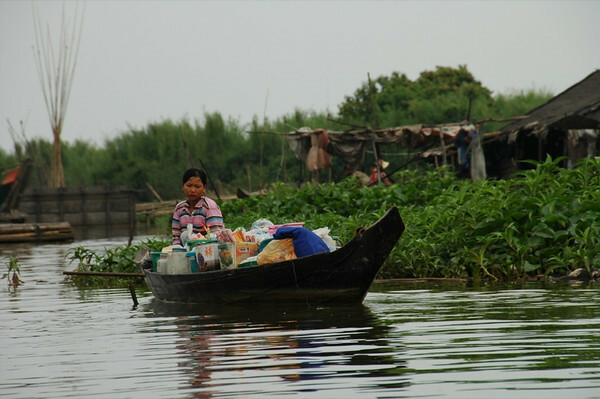 Read more about this boat journey from Siem Reap to Battambang. If you can't row your boat to shore, you get out and drag it! Read more about this boat journey from Siem Reap to Battambang. Being the dry season, water levels were low and the water was a turbid brown. The exhaust coming out of this and other boats (including ours) was a heavy black particulate and would make an environmentalist cry. As most people in this area are in survival mode trying to keep food on the table, care for the environment is not at the top of their priority lists. Read more about this boat journey from Siem Reap to Battambang. Local men work together to rebuild a boat house for someone in their community. Read more about this boat journey from Siem Reap to Battambang. A truck was overturned in one of the craters after cresting a steep hill. As the road looked iffy at best, we all decided to get out of the truck and let the driver navigate this obstacle alone, without our weight. 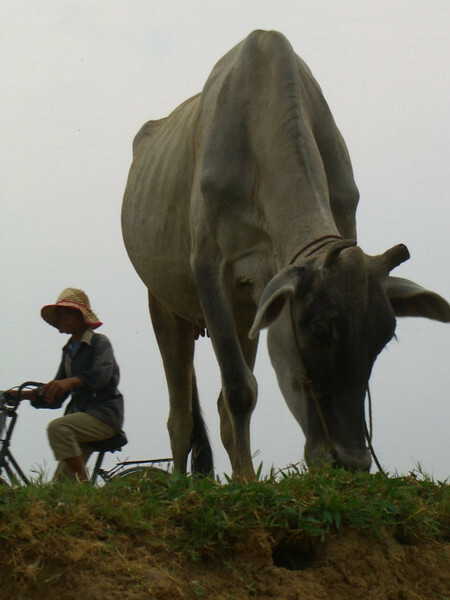 This cow could have cared less and simply continued to eat. Read more about this boat journey from Siem Reap to Battambang. The sophistication of floating houses went from the very basic, like this one, to relatively sound and secure houses with wood and tin. As we went by this house, more and more faces kept popping out to see us. Since we were traveling in the dry season (February), the water level in the river wasn't high enough to make the entire trip to Battambang by boat. After an 8 hour ride, 20+ of us got in the back of this pick up truck for 1.5 hours for the remainder of the way. 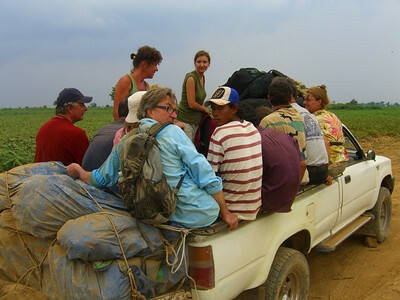 Our driver managed an impressive ride through steep craters and pits, listing sideways with a heavy load of people and bags. Each of us was covered in brown dust by the time we arrived in Battambang. Read more about this boat journey from Siem Reap to Battambang. 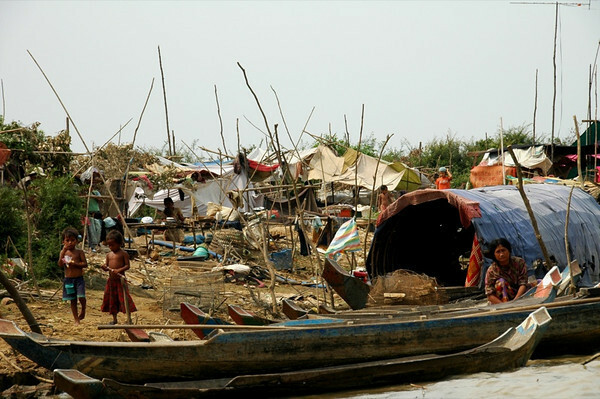 These families live very simply without much cover along the banks of the river. 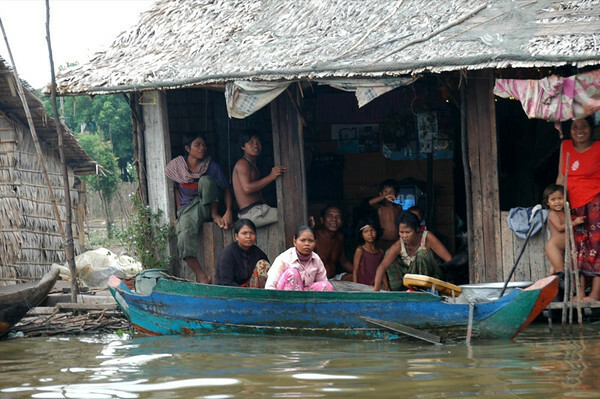 When the rainy season starts, they will need to move to higher ground or to a floating house. 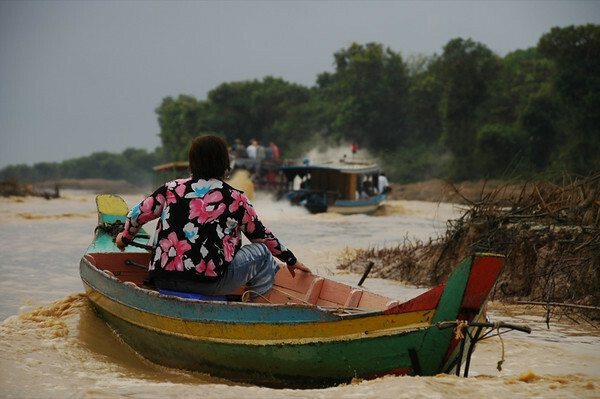 Read more about this boat journey from Siem Reap to Battambang.